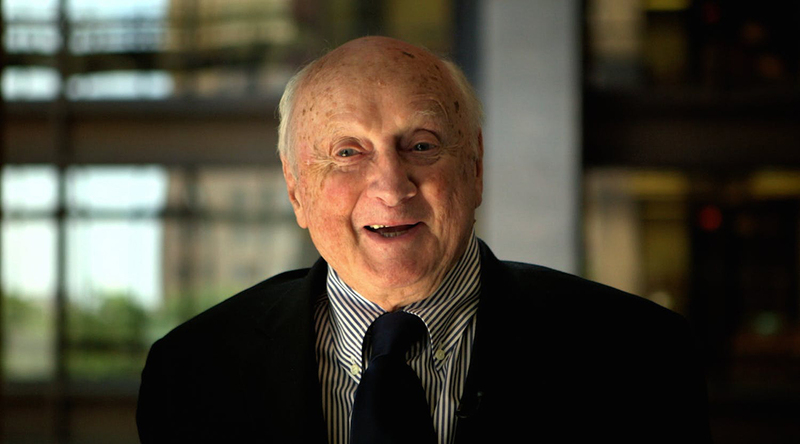 Kevin Roche, the Irish-born American architect responsible for the design of over 200 modernist buildings around the world, died at age 96 last Friday at his home in Guilford, Connecticut. His namesake firm, Roche-Dinkeloo, released a statement immediately following his passing. Roche had a major impact on American architecture. After moving to the United States from Dublin in 1948, Roche studied under Ludwig Mies van Der Rohe, another noteworthy European emigrant and pioneer of modernist architecture. Two years later, Roche joined the firm of Eero Saarinen, a revolutionary architect known for his sculptural and futuristic buildings. As Saarinen’s principal design associate, Roche adopted his employer's expressionistic style and his belief that architecture serves a higher purpose by uniting people and promoting social and cultural growth among various communities. After Saarinen’s death in 1961, Roche and his colleague formed their own architectural firm, Roche-Dinkeloo, in Hamden, Connecticut. Their joint mission was to revolutionize and beautify large spaces and museums in order to attract the masses and bring people together who share common goals and interests. The New York Times reported that Roche was often described as a trusted, modest, and soft-spoken individual, yet, his buildings were far from subtle. His conspicuous and often dramatic projects symbolized his love for glass technology, strong and memorable forms, as well as expressionist and modernist sculpting. Roche’s forward-thinking philosophies enabled him to adapt his designs to any situation where they proved to be flexible, versatile, and efficient. His works include the iconic TWA Terminal at John F. Kennedy International Airport, designed under Saarinen's direction, as well as the historic Ford Foundation headquarters in Midtown Manhattan, and the Oakland Museum of California. Roche was considered "the favored architect" of the Metropolitan Museum of Art, according to the NYT, where he designed each wing of the museum’s expansion, including the sun-lit Lehman Pavilion in 1975 and the massive glass pavilion enclosing the Temple of Dendur. He also completed the 1970s masterplan of United Nations Plaza, which included the build-out of three buildings, one of which is now a city landmark. As Roche’s projects flourished—he received the Pritzker Prize in 1982 and an American Institute of Architects Gold Medal in 1993—he became the go-to designer of major arts centers, corporate campuses, and federal sites. He designed the stark-white, geometric headquarters of General Foods in Rye Brook, New York, and the statuesque offices of J.P. Morgan Bank on Wall Street. Roche continued practicing architecture in his final years and didn’t slow down his work until his 95th birthday. Today he is survived by his wife of over 50 years, Jane Tuohy Roche, his five children, and 15 grandchildren. In July 2018, Collective-LOK (CLOK) unveiled their Roche/Dinkeloo Double, a temporary installation located below a cantilevered section of UMass Amherst’s Fine Arts Center. CLOK is a collaboration formed by architects Jon Lott, William O’Brien Jr., and Michael Kubo. The Fine Arts Center, designed by firm Roche-Dinkeloo in 1975, is located on the border of UMass Amherst’s campus. According to architect Jon Lott, the structure was conceived as “a bridge to the Mass campus, operating as an entry point between the town of Amherst and the academy’s campus. An arcade of V-shaped pillars line the structure’s south and north elevations, supporting studio space above and providing glimpses of the campus’s central quadrangle. The Roche/Dinkeloo Double is a two-sided wooden frame, measuring 24 feet in all dimensions. To match the scale of the abutting concrete structure, CLOK bundled their Douglas Fir 2 x 4’s to effectively create 4 x 8 super studs. The wood-framed structure meets the corners of the V-shaped pillar, resulting in a diamond-shaped room. A walkway diagonally runs through the installation, embedding it within an actively-used campus thoroughfare. Drawing on the familiar vernacular of wood-framed construction, CLOK views their installation as questioning the relationship between Roche-Dinkeloo’s brutalist intervention and the largely Italianate and Colonial Revival character of the surrounding context. From within the installation, the view upward is sliced in two. 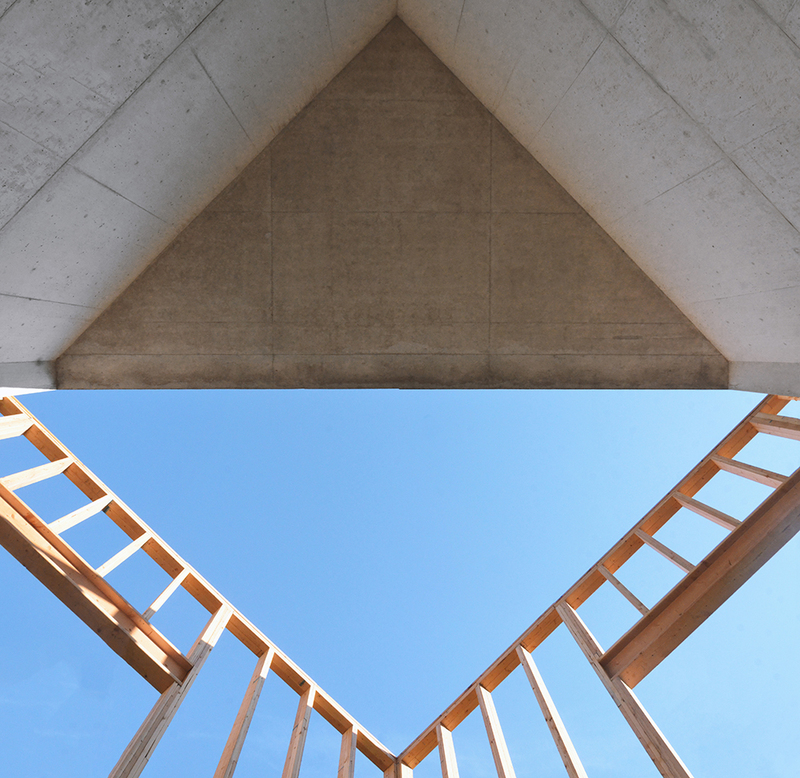 Half of the structure is weighed down by a looming triangle of concrete, while the other faces the open sky. Past work by Collective-LOK includes Heart of Hearts, a circle of nine, ten-foot-tall golden hearts installed in Times Square in 2016, and the Van Alen Institute’s 2014 redesign. The installation is in place until October 2018. Update 1/17/17: This post initially stated that the LPC excluded a colonnaded hallway and seating area near the lobby from the designation. The LPC included the colonnaded hallway, but excluded the seating area and the elevator hallway that connects the lobby and the Ambassador Grill. The post was updated with additional reporting to support these changes. Today the New York City Landmarks Preservation Commission (LPC) voted unanimously to landmark Kevin Roche and John Dinkeloo Associates' Ambassador Grill and Lounge and Hotel Lobby at the United Nations Hotel. The vote came after preservationists mobilized to seek protection for the interiors: A sequence of lush and mirrored spaces that today evoke the glamour of the disco era. New owners Millennium Hotels and Resorts, who bought the space five years ago and renamed it One UN New York, were set to convert the rooms to a more contemporary style. The Ambassador Grill and Lounge and Hotel Lobby opened in 1976 and 1983, respectively. In light of development pressure, the LPC moved swiftly to calendar the item in September, and the commission heard (all positive) public testimony from the likes of Docomomo, Robert A.M. Stern, Alexandra Lange, and others, in November. To the regret of many preservationists, the LPC decided not to include a seating area adjacent to the lobby's colonnaded hallway and the elevator hallway that connects the two landmarked rooms. "I'm happy the LPC called out the columned hallway, perhaps limiting the alteration of the lounge, but it's disappointing the [non-designated] areas didn't come up in the commissioner's deliberations today," said preservation activist Theodore Grunewald. "While we know that virtually no historic preservation battle is ever '100 percent,' and that preservation requires flexibility and must include [necessary] compromises, the exclusion of the seating area is still troubling." Like all city landmarks, the rooms have one final hurdle to clear: The City Council will vote in the coming weeks to officially adopt—or in rare cases, refute—the LPC's designation. Today the New York City Landmarks Preservation Commission (LPC) solicited input on the future of the city's best-known—and most threatened—postmodern interior. The commission heard testimony from its research department and members of the public on ONE UN New York Hotel's (formerly the United Nations Hotel) Lobby and Ambassador Grill & Lounge, two glittery disco-era spaces designed by Kevin Roche and John Dinkeloo Associates. As recently as January, the spaces inside the Midtown East building were set to be demolished by property owner Millennium Hotels and Resorts. Local luminaries like Robert A.M. Stern, Belmont Freeman, and Alexandra Lange, as well as a bi-coastal Docomomo contingent spoke in favor of landmarking. The item would be the first postmodern interior to be designated a New York City landmark, and the "youngest" after Roche and Dinkeloo's Ford Foundation (1963-68) which has interior and exterior landmark status. 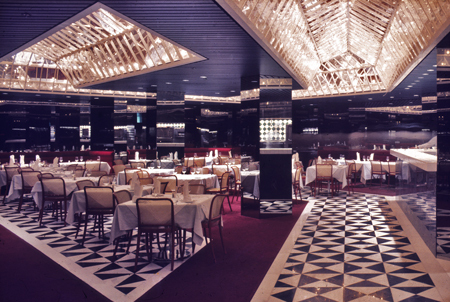 The Ambassador Grill & Lounge, a small U-shaped restaurant in a windowless basement (1976), sports inset light fixtures, vaulted faux skylight clad in trellised mylar panels, and more shiny surfaces than Studio 54, all of which create the illusion of capaciousness and light. 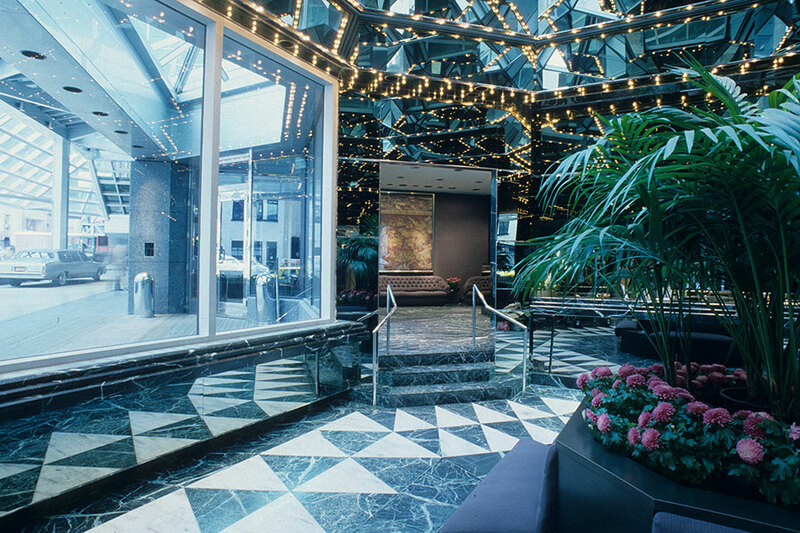 Along East 44th Street, the hotel lobby (1983) features a stepped glass dome roof accessed via a freestanding marble-columned hallway. The LPC’s research department called the connected rooms some of the "best public spaces" of New York from that period. The researchers' conclusions were reflected in public testimony that invoked the glamour of the rooms and their role in the see-and-be-seen public life of the city. 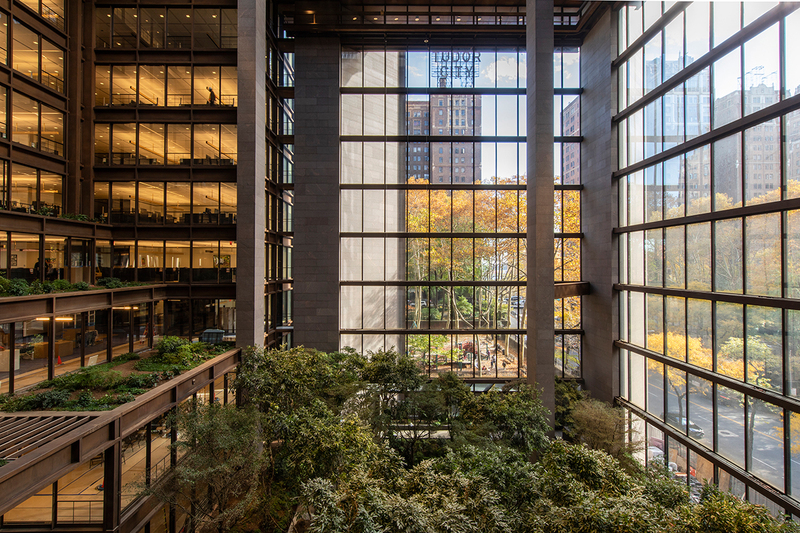 Liz Waytkus, executive director of modern architecture preservation organization Docomomo, called Roche and Dinkeloo's interiors “among the best” public spaces of the era. In contrast to the severity of modernism, the fluid spaces reflect a “humanistic” energy not often associated with the architecture of the time. Docomomo’s Jessica Smith read a statement on behalf of Robert A.M. Stern. Stern offered “strong support” of designation, noting that Roche designed both the building itself and its interiors. He called the grill and lobby “masterworks of modernism produced by a master at his prime,” comparing them to surviving postmodern peers like Sir John Soane's Museum in London and Adolf Loos’s American Bar in Vienna. Smith also read a statement for Curbed architecture critic Alexandra Lange, who said her research on postwar American corporate design suggests the rooms represent a “key moment” in late modern design. "The interiors change scale and increase the sensuality of a pair of large skyscrapers that draw the prismatic curtain walls of the UN buildings inside, creating a total work of architecture." To the frustration of many who testified, including Docomomo and the preservation advocacy organization Historic Districts Council (HDC), the commission did not include the lobby’s sunken seating area in the designation. The LPC said it believed the relative lack of original elements in the seating area merited exclusion, as the main lobby and hypostyle corridor under consideration offer a “processional experience” to and from the grill. The iconic interiors have attracted attention beyond New York City. Daniel Paul, a Southern California–based architectural historian and expert in late modern glass skin architecture, flew in from L.A. to attend today’s meeting. Early this morning, he went to the hotel to check on the state of the interiors. Millennium, he said, has altered the space substantially but not irreversibly. In the grill, the faux skylight is covered in a semi-opaque “cheap-looking” plastic, while the neon acrylic wine racks were replaced by wood features. The bar’s tivoli lights are gone, and its mirrored backdrop has been replaced with wallpaper. Representatives from Millennium did not comment at today's meeting. As the discussion concluded, LPC chair Meenakshi Srinivasan stated that the commission would do further research and vote at to-be-determined meeting. Today the Landmarks Preservation Commission (LPC) voted to calendar Kevin Roche and John Dinkerloo's Ambassador Grill and Lobby at ONE UN New York Hotel, previously known as the United Nations Hotel. Now that it's on on the LPC's calendar, the space is safe from demolition (for now). The luxe late modern United Nations Plaza Hotel Lobby (completed 1983) and Ambassador Grill & Lounge (completed 1976) at One United Nations Plaza were threatened with demolition when the current owners, Millennium Hotels and Resorts, closed the restaurant to commence a significant renovation that would have stripped the space of its characteristic mirroring, white-veined black stone, and trompe l’oeil skylights. Preservationists, naturally, were outraged. Advocacy groups like Docomomo's national chapter and MAS were joined by local preservationists Peg Breen, president of the New York Landmarks Conservancy, Theodore Grunewald, vice president of the Committee to Save the New York Public Library, and members of local Docomomo chapters who together rallied to save the spaces by asking the LPC to consider designating the lobby and grill as interior landmarks. There are currently 117 interiors that are New York City landmarks, and only four of those are restaurants. When reached for comment, a member of ONE UN New York Hotel's management team told The Architect's Newspaper that, with the General Assembly in session, the hotel couldn't answer questions about the status of the Ambassador Grill. "You picked the wrong time to call," said a woman who would only give her first name, Pat. 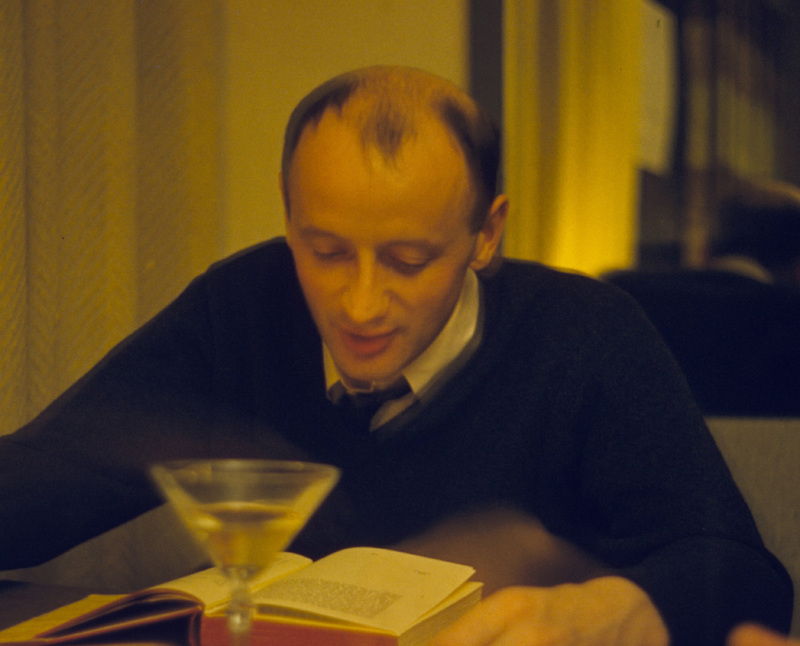 Kevin Roche's late modern interiors at the United Nations Plaza Ambassador Grill & Lounge, and Hotel Lobby are in jeopardy. Millennium Hotels and Resorts, the owners 0f ONE UN New York Hotel (the space's current name) have closed both spaces for possible demolition. Docomomo US, the leading modern architecture preservation group, has filed a Request for Evaluation (RFE) with the New York City Landmarks Preservation Commission (LPC) to grant the UN Plaza Ambassador Grill and Lounge and Hotel Lobby New York City Interior Landmark status. 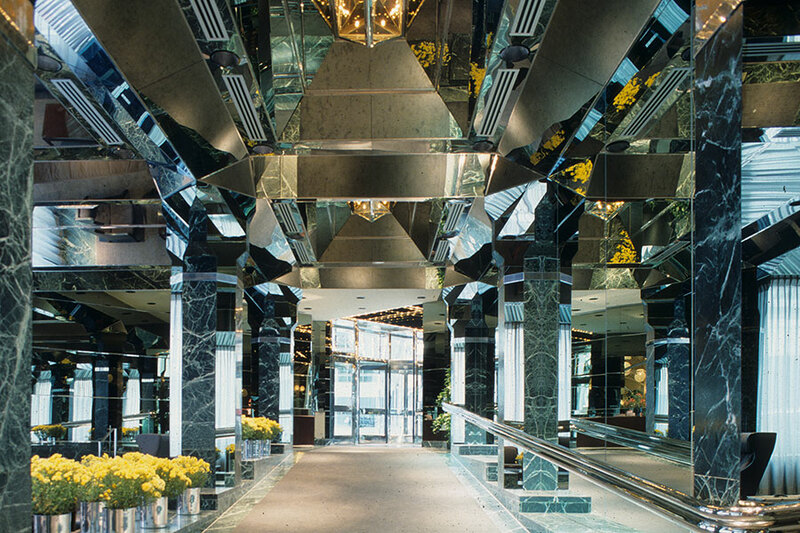 The interiors, states Docomomo, are strong examples of New York City late modernism. Roche designed the space with his partner John Dinkeloo (as Kevin Roche John Dinkeloo & Associates) for the United Nation Development Corporation. The UN Plaza Hotel and Office Building was completed in 1975 and Two UN Plaza was completed in 1983. Sherman McCoy would feel at home beneath the octagonal glass atriums, walls of mirrors, inset light fixtures, sharp geometric motifs, a sumptuous color palette, and a trompe l’oeil faux-skylight contribute to the luxe design. Millennium Hotels and Resorts has begun exploratory work—without permits—on the project, removing sections of the metal paneled drop ceiling that reveal the sprinkler system. Haphazard work, Docomomo claims, could irreparably damage the interior. 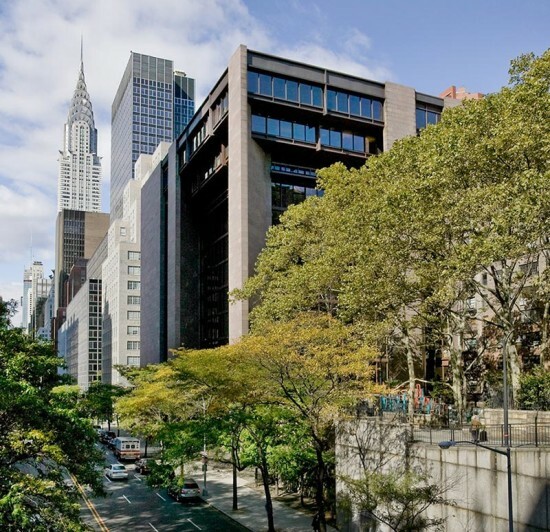 Docomomo is asking its network of preservationists and others concerned about Roche's interior to write to the LPC to request an emergency hearing. 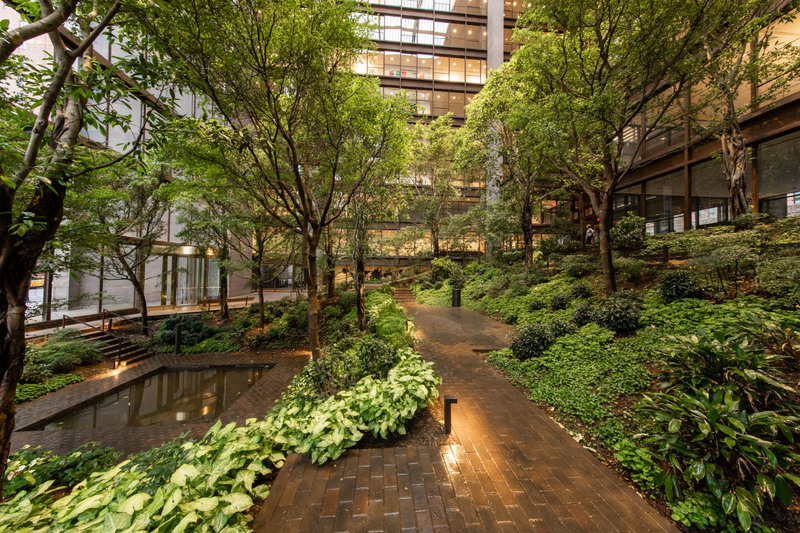 The Ford Foundation announced today that Gensler will lead a $190 million renovation of its Manhattan headquarters in East Midtown. The renovation will bring the building up to code while preserving the 1967 modernist design by Kevin Roche and John Dinkeloo. The renovation will double the square footage available for nonprofits (in part by reducing Ford’s own office footprint) with two floors dedicated to nonprofit organizations, create a new visitor center, art gallery, and event spaces, and open up the existing layout. The foundation is aiming for Gold LEED certification and will be investing in sustainable LED lighting, mechanical and ductwork, and HVAC systems. The building will also be equipped to harvest stormwater and natural daylight. A near-perfect square, the building is distinguished by its 174-foot-high atrium full of fern pines, weeping figs, bougainvillea, and camellia—plantings that will all be replaced with a new design by landscape architect Raymond Jungles. However, the nearly 5,000 pieces of furniture by Warren Platner and Charles and Ray Eames will be reused “as much as possible.” The renovation is expected to be complete summer 2018. Kevin Roche’s original 12-story concrete-and-steel, International Style building was widely praised when it was first built. 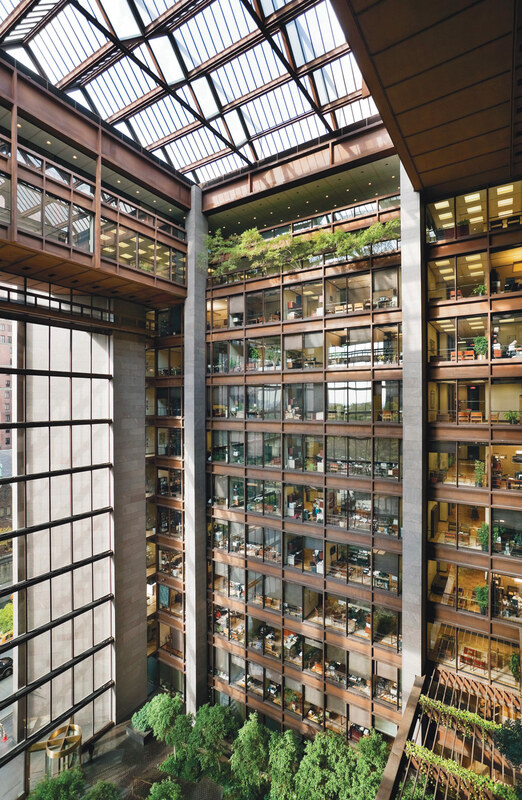 In The New York Times, Ada Louise Huxtable wrote that the Ford Foundation headquarters is “that rarity, a building aware of its world.” She also quoted Roche on the design, who reportedly said “It will be possible in this building to look across the court and see your fellow man or sit on a bench and discuss the problems of Southeast Asia. There will be a total awareness of the foundation’s activities.” In 1995, the building won the AIA Twenty-Five Year award and in 1997 New York City’s Landmarks Preservation Commission designated the exterior, atrium glass walls, and garden of the foundation headquarters as an official landmark. This morning, The New York Times reported that the current president of the Ford Foundation, Darren Walker, takes his responsibility of the building very seriously. “We’re not only grant-makers but stewards of a building that Henry Ford II commissioned and was deeply involved with. This building is part of our legacy and was a gift to the city,” Walker said. Roche’s declared design intention was to create an open urban plaza that defers to and displays the monumental Beaux-Arts façade of the museum. He wanted to distinguish the urban face …on Fifth Avenue from the park portions of the other three sides... (The Chapter) is hopeful that any modifications to the present plaza, to the extent that they are necessary, conform to the underlying principles of the Kevin Roche design-preserving an open urban plaza with unimpeded access to (his ingeniously three –sided) entrance stairway and unobstructed visibility of the stairs, adjacent facades and ground level entrances. And with the results now plain, how right they were. With the exception of a masterwork of exterior nighttime illumination by Hervé Descottes and his L’Observatoire International that subtly responds to the architecture’s classical hierarchies and the replenishment of the subsoil, it is only now that the relative dignity of this earlier renovation is fully evident. Restoration of the restoration was a worthy option after all. Apologies are due them. Despite some working drawings from McKim, Mead, & White in which the option of flower and shrub beds appeared alongside the façade elevation, their final intent was clear with the dignified built encounter of limestone and pavers accentuated further by the pedestrian-scaled Roman grills that inform urban places of majesty and safe-keeping. OLIN’s decision to place such beds there seems a pallid suburbanization vying to extend the park setting instead of contrasting it. Imagine flowers alongside the Pantheon or its Renaissance-descended Palazzo Farnese? Meanwhile, the new fountains, while retaining a classical symmetry, end up compromising the pomp and circumstance of the Roche-thrusting and much expanded grand stairs with a tight perplexing proximity. The visitor today cannot help but wonder if it is some disguised stab at crowd control. And while their new placement was meant in part to make more legible the secondary street-grade entrance at 81st Street, the trade-off is untested and dubious; who can resist mounting those stairs? This is a classical threshold at its iconic best. The waterworks vary in height and rhythm in a mannered echo of WET Design’s signature creations yet at low height the sprouts seem more than a tinkle. 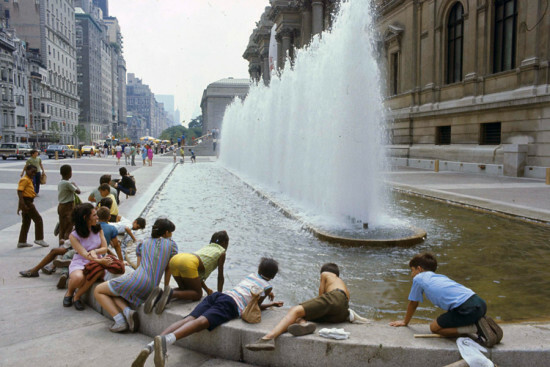 The previous fountains recalled the classical rigor that informed so much of high Modernism. This was never meant as a playful place. Instead it was always meant for unencumbered dignity; all who enter should arrive as big shots knowing that they each held a key to this great repository of beauty and truth. Likewise the addition of dozens of trees even as now young and leafless obscures the architecture. What about in 20 years? It is hard to object to more trees in this warned up day and age but here is one place where the sum is less than the design parts. Finally and through no fault of either client or landscape architect there is a the all too frequent New York curse of visual pollution as arises in public places, where governing statures collide and, in turn, destroy the clarity of the guiding design blueprint. Here at the Met plaza, it is the curbside licensed food vendors. Ironically the spot-on instinct on the Museum’s part to include in its initial plan outdoor kiosks for such inevitable trade was denied by the oversight Landmarks and Public Design Commissions in convenient disregard for the ultimate reality of the streets. With the present redesign, Mr. Koch might well wish that for now at least his name not be its site label after all. He seems shortchanged as much as those he generously aims to benefit.